These are popular with groups fishing just for fun or organizing their own mini tournament. Single engine with 4 fishermen maximum. The prices includes boat, cooler with ice, captain, sailor, fishing equipment and lures. Box lunches, fishing license, beverages, bait are not included. Designed especially for the waters off of the cape these hulls are wide and spacious. Also popular among tournament anglers. Single engine (but fast) with 6 fishermen maximum. Twin engine with 8 fishermen maximum. Another tournament favorite with a sleek, fast hull. Twin engine with a maximum of 6 fishermen. 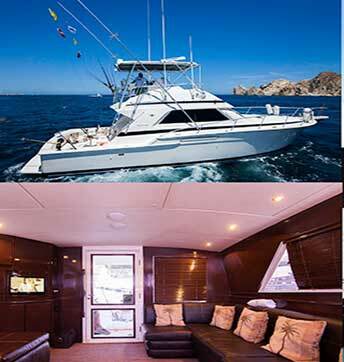 Indulge yourself and your family on the 43 ft Don Luis Yacht. Maximum group size: 11 people.